When the theme for this week's Photo Gallery was set on Friday September 14th, I knew I'd have to be quick off the mark if I wanted to post the photo I had in my head. At the time, baby number two's arrival was imminent and I didn't know where I would be on Wednesday September 19th when the Gallery went live. 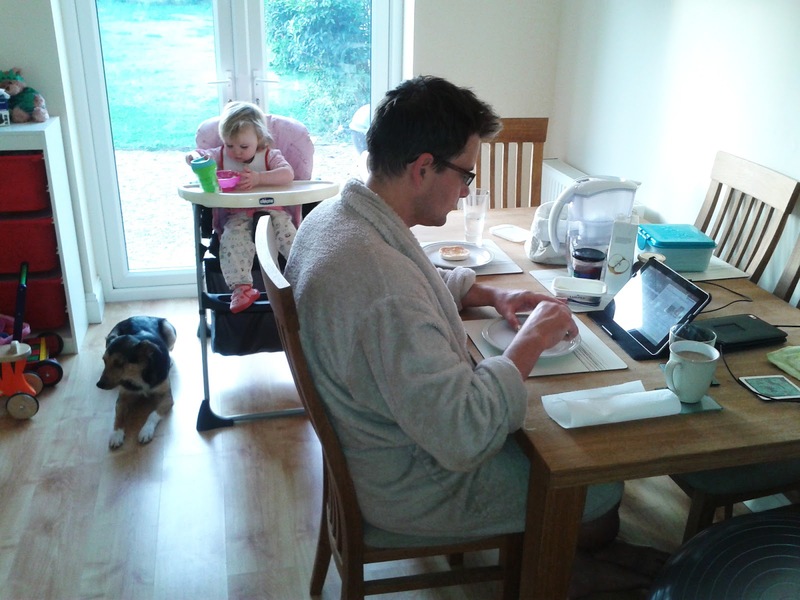 As it turned out, I was coming home from the hospital having given birth to baby Tobias George on the Monday. So on the Saturday morning, I knew that could very well be the last breakfast we ate together as a family of three. That was a scary thought - we were about to become a family of four! And here is my photo! It's only taken on the phone's camera and isn't the best lighting but it captures something special that we'll not see again in this household. 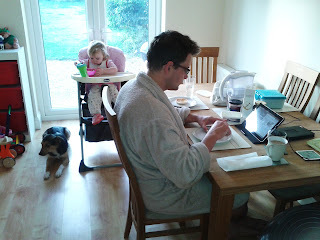 It's a typical breakfast scene for us; Frans absorbed in his tablet, Elizabeth happily scoffing her brekkie, the dog hovering for anything she might drop and my breakfast getting cold while I do 'something else, real quick'. Next time you'll see a baby in a bouncer somewhere in there too. Have a peek at the other entries here.